Born in Romania, Mirela Roznoveanu was a recognized literary critic at 24. She has published volumes of essays,literary criticism, poetry, and novels. 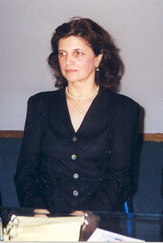 She has been known as a noted dissident writer and journalist involved in the 1989 Revolution. In 1991, she came to the U.S. where she continued to be prolific in her writings. “A Few Notes on Romanian Literature as World Literature”, edited by Mircea Martin, Christian Moraru, and Andrei Terian (New York and London: Bloomsbury Academic, 2017), 374 pages. “The Scholar and the Poetry.” RSAA, 1:2018. “Aerul Depărtării” by Noemi Marin. Bucharest: Tritonic Publishers, 2017. The merged pdf file of Life On the Run. 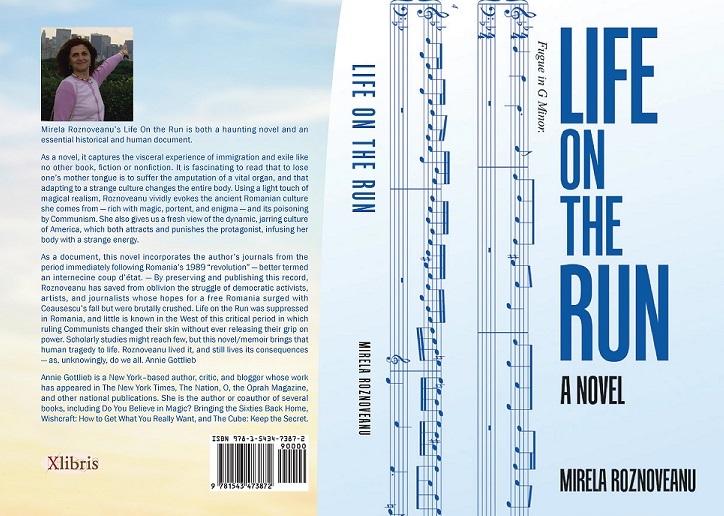 Mirela Roznoveanu’s Life On the Run is both a haunting novel and an essential historical and human document. As a novel, it captures the visceral experience of immigration and exile like no other book, fiction or nonfiction. It is fascinating to read that to lose one’s mother tongue is to suffer the amputation of a vital organ, and that adapting to a strange culture changes the entire body. Using a light touch of magical realism, Roznoveanu vividly evokes the ancient Romanian culture she comes from — rich with magic, portent, and enigma — and its poisoning by Communism. She also gives us a fresh view of the dynamic, jarring culture of America, which both attracts and punishes the protagonist, infusing her body with a strange energy. As a document, this novel incorporates the author’s journals from the period immediately following Romania’s 1989 “revolution” — better termed an internecine coup d’état. — By preserving and publishing this record, Roznoveanu has saved from oblivion the struggle of democratic activists, artists, and journalists whose hopes for a free Romania surged with Ceausescu’s fall but were brutally crushed. Life on the Run was suppressed in Romania, and little is known in the West of this critical period in which ruling Communists changed their skin without ever releasing their grip on power. Scholarly studies might reach few, but this novel/memoir brings that human tragedy to life. Roznoveanu lived it, and still lives its consequences — as, unknowingly, do we all. 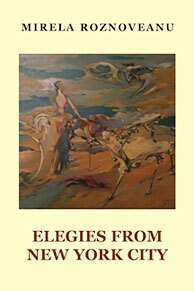 Elegies from New York City. Poems, 2008. The Civilization of the Novel: A History of Fiction Writing from Ramayana to Don Quixote. Bucharest: Editura Cartex (Cartex Publishing House, cartex2000r@yahoo.com) 2008, 694 pp.ISBN 978-973-88670-79. It is a study dealing with the epic architectures (novels) developed by various civilizations over the last five millennia. Focus is on the on the novel-like aesthetic works overlooked in western exegeses and on those which have never been developed or experimented within western culture. We find different sets of values, a new kind of theoretical and critical discourse accommodating epic architectures developed in practically all civilizations and cultural periods: Vedic, Sumerian, Persian, ancient Egyptian, old Hebrews, classical Greek and Roman, down to European during Middle Ages, and further on to the early modernity of the Renaissance. A compelling piece of solid scholarship, based on a wealth of excellent bibliographic sources (mostly in English, but also in French, Spanish, Italian, German), accompanied by over 1,000 footnotes, extensive index, and abstracts in English, French, and German, this volume is certainly a valuable addition to the study of comparative literatures around the world. 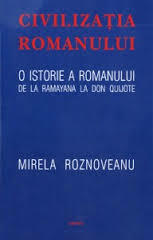 The book received the 2008 Award of the Romanian Society of Comparative Literature. The Romanian born author is a novelist, literary critic, poet, and faculty member of the New York University School of Law. Vladimir F. Wertsman, the Chair of the Publishing and Multicultural Materials Committee of the Ethnic Materials and Information Exchange Round Table of the American Library Association. 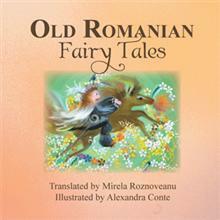 Old Romanian Fairy Tales, 2013.